Since this is a long weekend I thought I would show some older posts that new followers may not have seen before. Enjoy the weekend!! 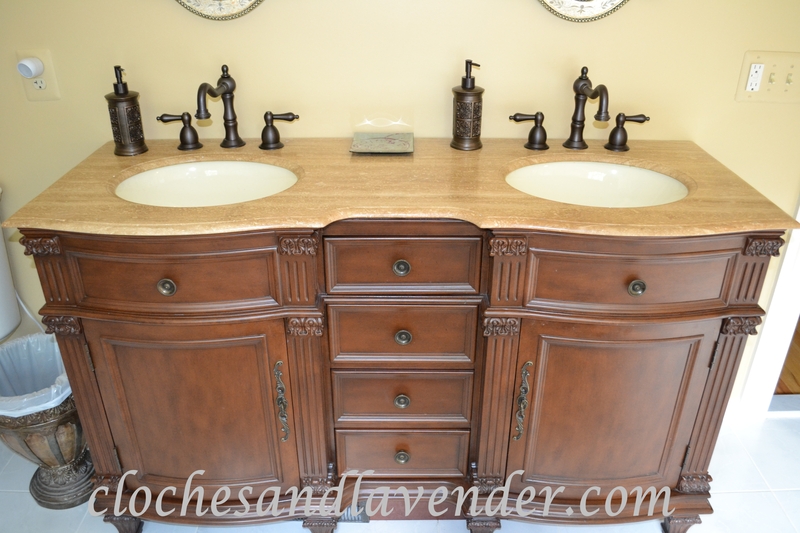 Our master bath was built in 1994 before it was popular to have double vanities and to have travertine tile installed. My question was; how could we update the bathroom without doing a total gut job? We were not spending that kind of money, no way. But in 2010 we had to take the plunge on a budget re-do. As necessity is always a great motivator. We ended up having a problem with some tiles on the shower seat and having never tiled before, we needed to learn as we went along. John started there by redoing the whole seat and actually making it a bit smaller. It was a tough job but he fixed the problem and then we moved to the tub area. Again, when we were building our home in 1994 the thing was to have a tub deck with your jetted tub; not have it freestanding as is popular today. 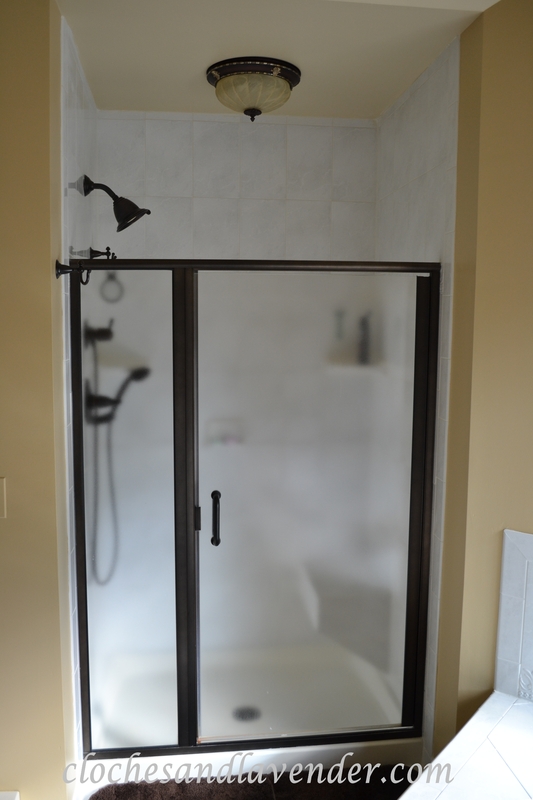 We knew we had to change something, John and I came up with idea of changing all the plumbing fixtures to oil rubbed bronze and while we were at it change the front part of our tub. We decided to take the tile off the front and give it an updated look with a wood front. John built the front using high-end wood for the flat piece and then I had him put moldings to make boxes on the front. I figured I would stencil the front parts using plaster and then I dry brushed the stencils with a metallic silver-grey paint. We then decided to take the wallpaper down (we built when it was in and did this when it was out and now it seems to be in again! LOL Go figure.) and have the bathroom painted. 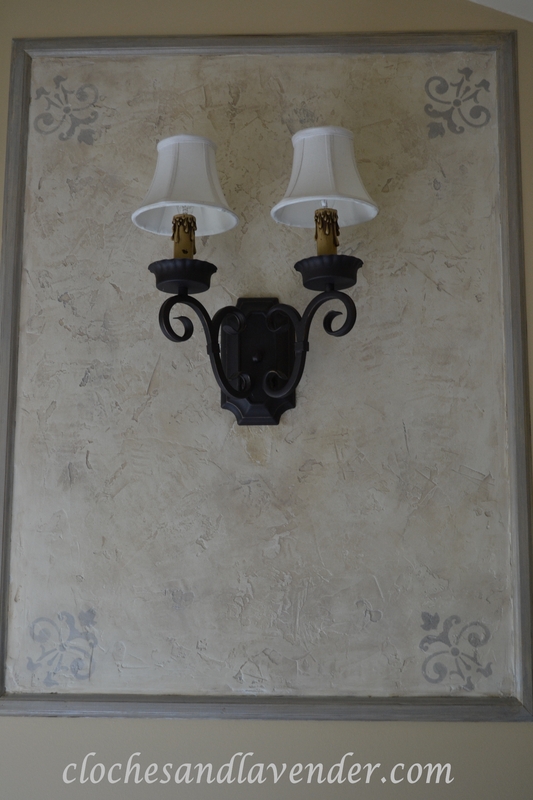 During the painting, I decided why not add plaster to the walls where the two sconces were to give it an old world look and faux them in the process. 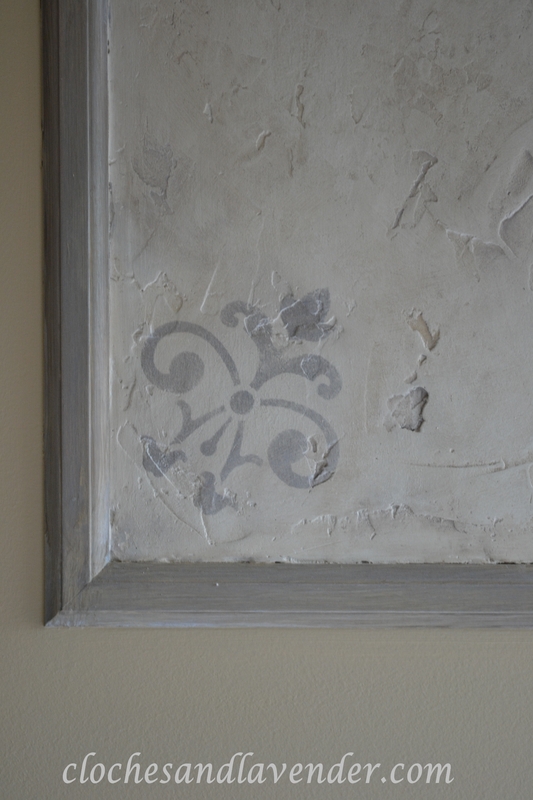 After that part was done I decided to add stencils in the corners of the plaster in silver to add a tone to blend in with our tile since it is white with gray running through it, I felt that had to be tied into the room somehow and could not be ignored. 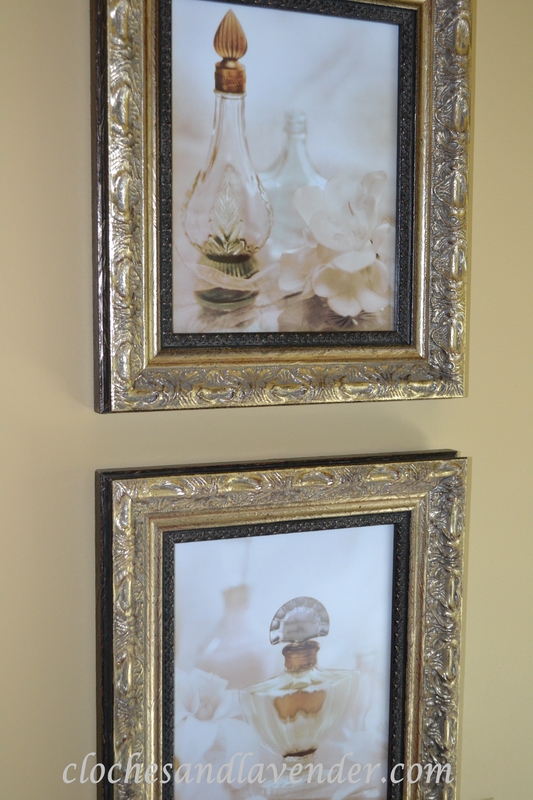 These came out nice and it seems as if they are actually on an “old” part of the wall. Even on a budget, once you get going the project always creeps. We decided that the original white vanity with one sink should be updated too. So, the plumber come in after I found a double vanity sink online and ran another sink line and that worked out great. I love our new vanity, the Euro height is so much easier on your back. 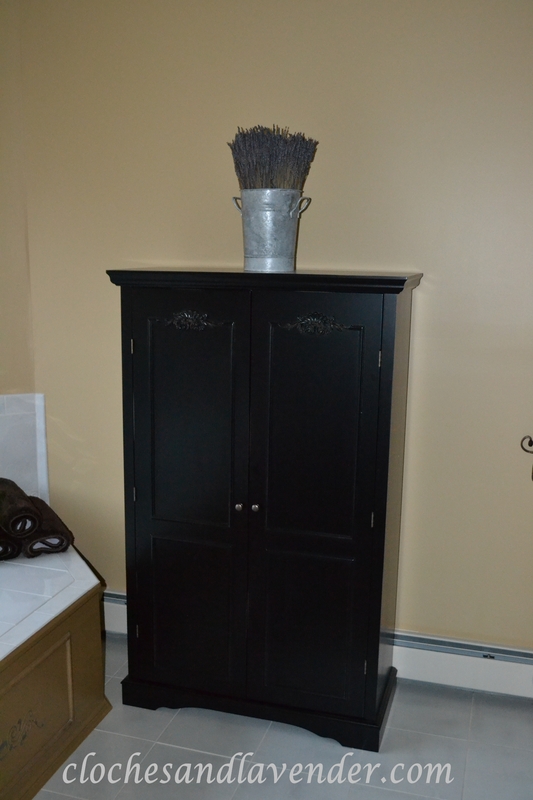 This enabled me to go with two mirrors and two vanity lights as well. The last pieces of the puzzle were updating our lighting fixtures to oil rubbed bronze and changing out our shower doors to bronze to match the rest of the fixtures we changed. 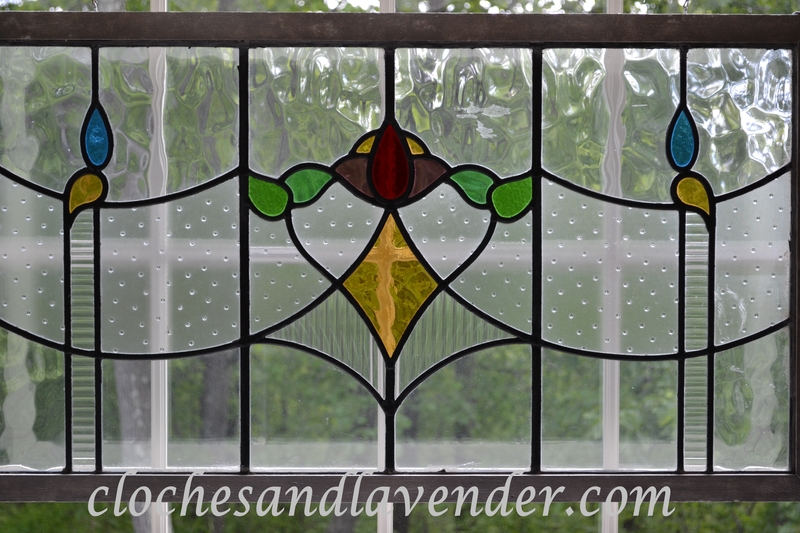 One final piece that was added is a stained glass window that we won on eBay many years ago. We suspended it in the window with small chain and it provides a nice illusion of privacy and color. 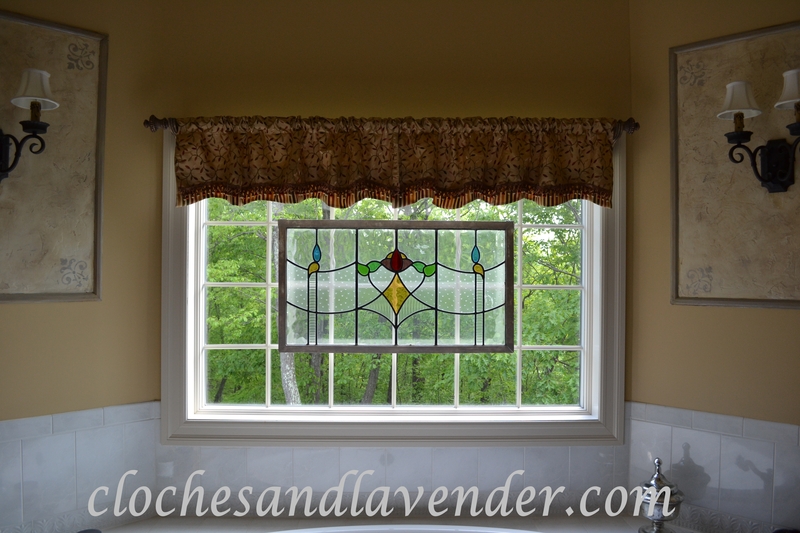 We don’t need much privacy where we live in the woods so I used a valance over the large window to add elegance. I still feel like I got a brand new bathroom and it took a little money, hard work on our part which we don’t mind and it turned out beautifully. I love your bathroom! So many nice things to look at! Great job up the updated bath. 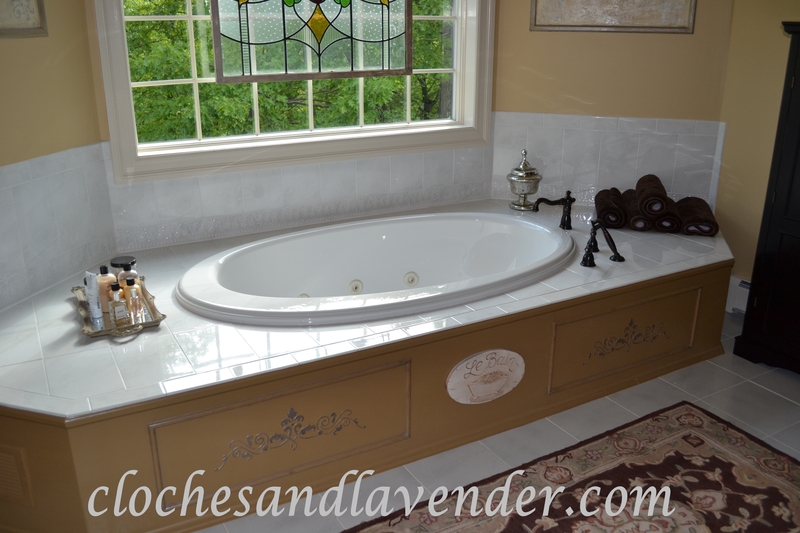 I really like the stencil/plaster inserts and tub front. 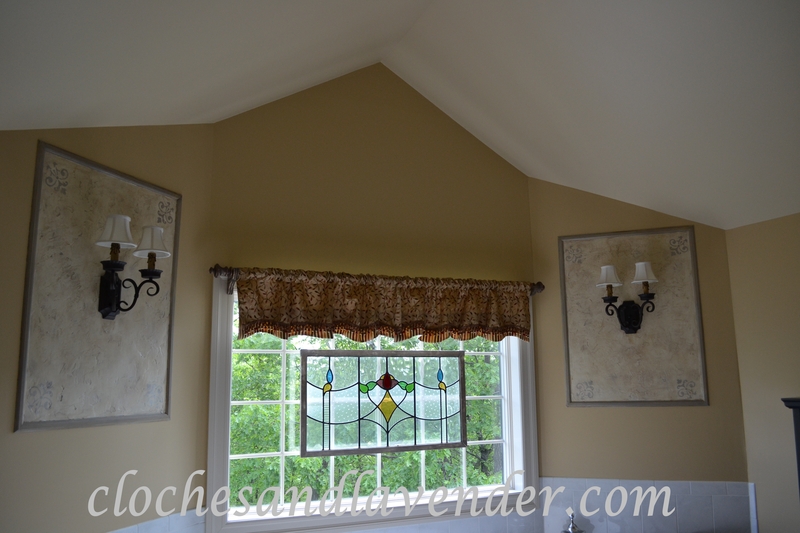 Gorgeous transformation….love the new vanity…yes, that height is the best..do not know how we ever did it with those lower vanities…I love the stained glass…always a favorite for me! Thank you very much Shirley. It was a lot of hard work but we are so happy with the transformation. Oh my your bath is gorgeous. LOVE the stained glass in the window. Lots of other great touches too. Thanks for sharing with the newbie party. I just love your bathroom re-do! I have the same oil rubbed bronze fixtures. Aren’t they gorgeous? I too was going for the old world look. 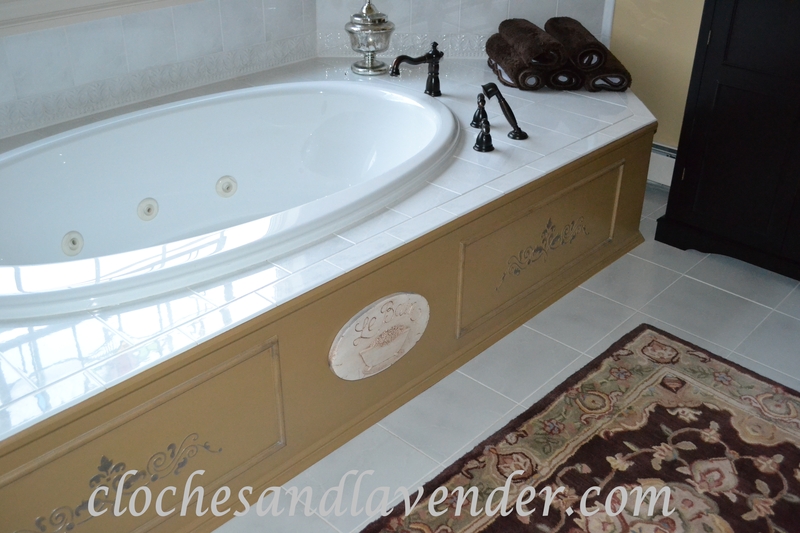 The front of your tub looks fantastic with the stenciling. Donna thannk you very much. You did a fabulous job! It looks so new! I love the mirrors!! they are enchanting!! You did an amazing job, It’s gorgeous. Thanks for sharing. Your bathroom is absolutely gorgeous! I am your newest follower via email. Thank you for visiting. Your updated bathroom is gorgeous!!! What a lovely space. I LOVE your vanity and mirrors! Thank it took a long time on the internet to find. The bathroom did turn out beautifully. 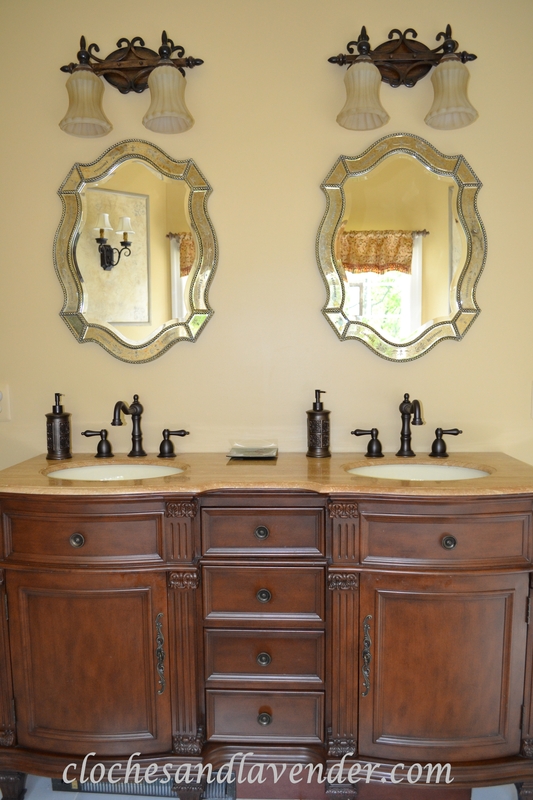 My favorite is the vanity area….it is so elegant. The entire space feels like a hotel spa. How fun! Thanks for sharing your updates at Show & Tell. Love them. Thank you so much I hope you continue to follow me. The commode is hilarious beautiful. Your bathroom is stunning – the glass window, the vanity, wow! Love it all! Thanks for linking up this week! Reblogged this on Cloches & Lavender. 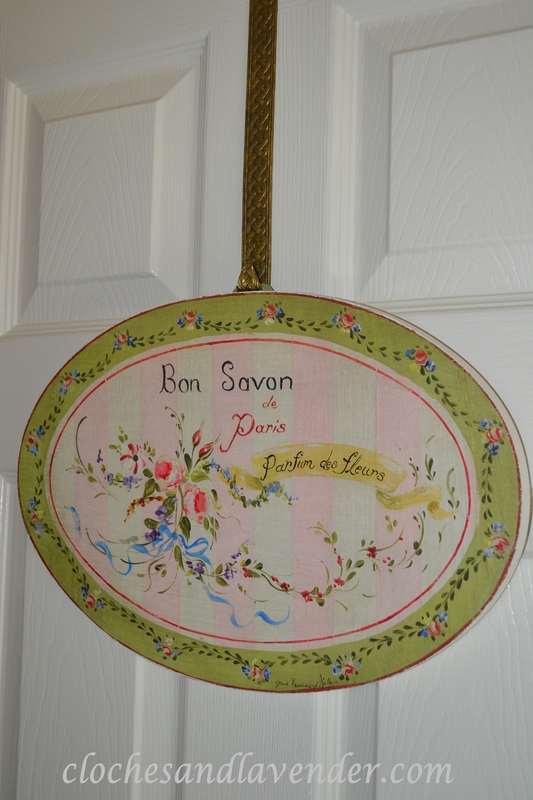 Isn’t it wonderful when you have a project turn out so well and stay within a budget! What a great transformation! Love the stained glass window! Yes it is and the budget sitiuation at the time was crucial. I love the way it turned out we are very haopy. 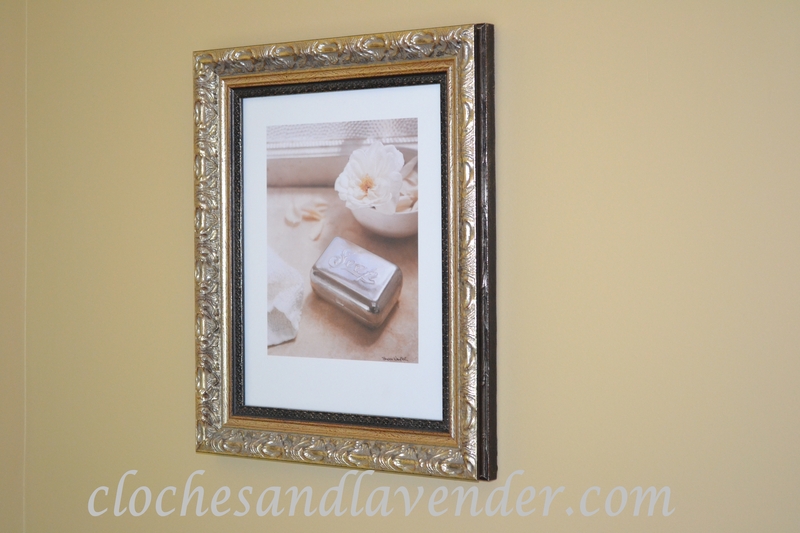 Please follow Cloches & Lavender. I follow you already. Your bathroom is gorgeous and I especially love your new vanity. 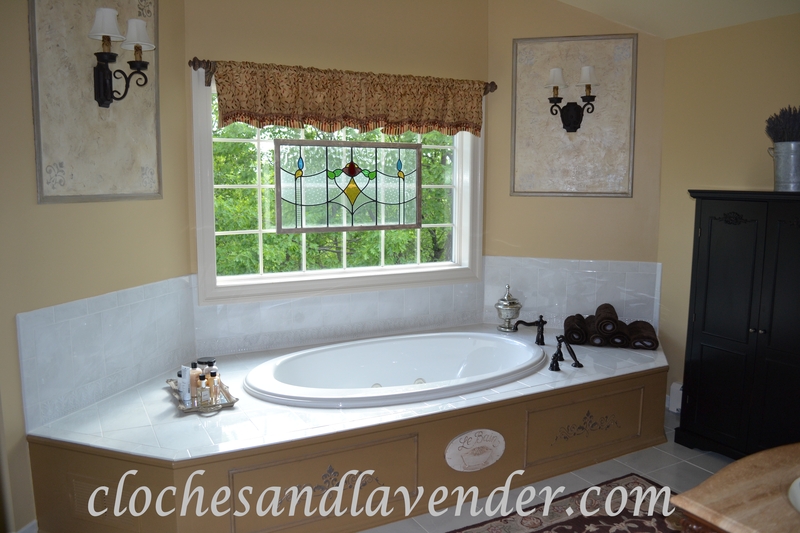 The stained glass window adds a nice touch to your window above the tub. I always wanted to do something like that but I don’t have the privacy and have Plantation Shutters. We have a lot of privacy where we live. Thank you so much for your lovely comment. I love it, especially the two sink vanity. That vanity is so classy and adds the right touch!